Our Mission is to provide quality care in a comfortable home like setting. 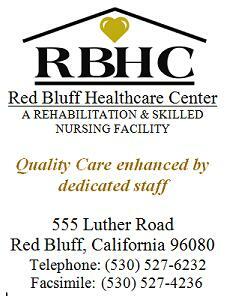 Many of the patients admitted to Red Bluff Healthcare Center (RBHC) want to return to a lifestyle they enjoyed before their hospital experience. This is why we are dedicated to rehabilitation. Our outstanding discharge rate proves it. Highly qualified physicians, nursing staff, rehabilitation professionals, activity staff, registered dieticians, and social service personnel work hard to ensure that each resident achieves and maintains their highest level of independence. At RBHC there is a total commitment on the part of our staff members to provide the highest quality care to the residents we serve, 24 hours a day. Copyright 2012 Red Bluff Healthcare Center. All rights reserved.